How you fussy-cut your fabrics will have a dramatic effect on the look of your paper piecing. Using stripes and geometric prints on the outer edge of diamond shapes will act as a frame around fussy-cut motifs for the centre and surrounding 8 hexagons as shown in the sketch above. 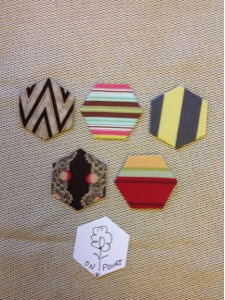 Consider whether you need to fussy-cut with the featured motif "square" or "on point" to achieve the desired effect. 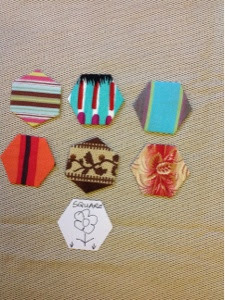 This example is taken from the quilt: "Josephine Baker meets Carmen Miranda"
These hexagons above are all cut "square"
These hexagons above are cut with the motif or stripe "on point"
Thanks for this tip. 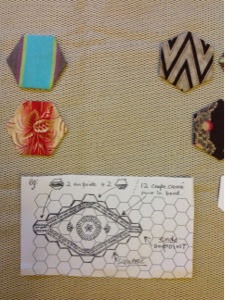 I am fascinated with the idea of fussy cutting the hexagons and this really gave me a better understanding!